Rated: R for language, violence, and brief drug use. Mark Wahlberg returns to the big screen for the first time since 2010’s award-winning The Fighter and does so in a pretty big way. 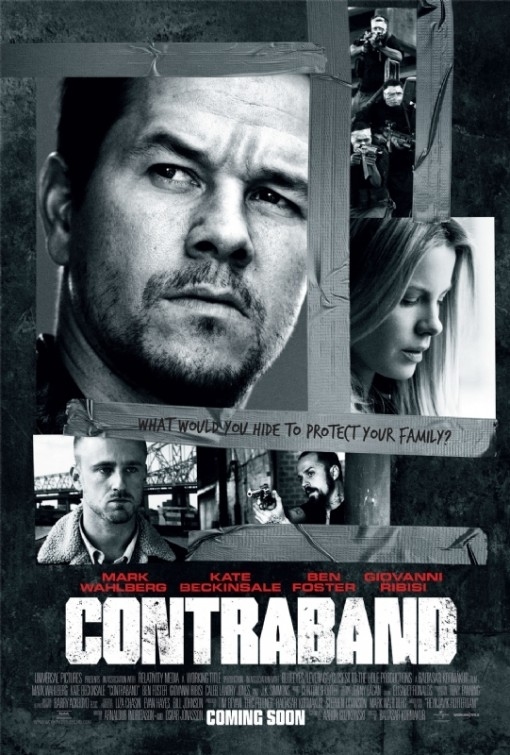 Contraband combines the style of a not-so-well-known (yet capable) director, a familiar story arc, a conglomerate impressive cast, and non-stop action so well. And while the movie plays on certain storylines that viewers will identify from other films (Gone in 60 Seconds, The Italian Job, The Mechanic, etc), it does so in a manner that piques the interest and keeps the attention! The balanced action-to-drama ratio: makes for a fun watch literally free of what I like to call “time-check moments.” [“Time-Check Moment”: the point(s) in a movie during which the viewer, plagued with boredom from the featured presentation, looks at the watch wondering how much time is left.] The characters’ stories, passions, and concerns are believable and add the sense of realism that ends up highly necessary in “familiar” heist/revenge films such as this. The cast: An impressive cast works so well to tell this story. Of course Wahlberg and Beckinsale shine in their parts, as do Giovanni Ribisi and Ben Foster. (Ribisi and Foster’s performances respectively are the best in the film). But some other added flavor to the cast in J.K. Simmons (Spider-man), Lukas Haas (Inception), David O’Hara (The Departed), and more, truly added the additional dimension and depth to this film that is necessary when presenting a film with an expected end. The problem, however, remains that the expected outcome causes a bit of a disappoint. While Contraband is better than all of the straight-to-dvd films cut from the same mold which clutter the shelves of your local movie rental place, it still is predictable and formulaic. Many outcomes in the film can be seen coming a mile away. While a few twists and turns exist, the outcomes that tend to matter most to the film are foreshadowed early on and expected. But, hey, not every movie can be a shroud of mystery! The action and the cast make for a great and welcomed distraction (for lack of a better word) and highly entertains. Overall, Contraband is worth seeing. ESPECIALLY during the month of January when, traditionally, not much worth seeing hits theaters! Check it out, come back, and share your thoughts in the comment section! Next The Golden Globes “Guess Who’s”! Good review Mr. T, i’m glad you enjoyed this one. I hope to see it in the next few days! you said it perfectly Matt! Let me know your thoughts once you see it! I do have to say Mr T, I disagree with you a little on the action. Not that the scenes weren’t cool enough, it was just HOW they arrived at the situations… some of the plot points were a little weak. But yeah, we’re probably both at about the same place. It was a’ight. You know? haha. I knew that you would key in on the “MR” part! I just knew it! I see your point about HOW they arrived to each situation. It was a so-so film. So, it sounds like I should file this under “worth watching on a rainy afternoon when nothing else is available”? yep! that’s a great plan Morgan! I agree wholeheartedly! You’ll have fun that way! mm, after Fighter that would be a pretty accurate statement. Not a bad movie, just not something you have to rush out to see. Sounds even worse than that…at least the story worked in Gin60. yeah, I couldn’t help but be thinking about Gone in 60 Seconds, but it veered away from that as the movie progressed. turned out okay. but that’s all…just okay. This felt like a 3 out of 5 film from the trailer, I don’t know why but I think you make a case for it with this review . Worth seeing then but it won’t win any awards. it’s worth seeing. Yes. Just don’t expect any award winning performances! the predictability/paint-by-the-numbers plot was pretty ho-hum. Will be sure to look for your review when I visit your page! the cast was truly the best part of the film. Glad you agree.